Great card for the middle of the week, when many are scrambling to finish work projects or are busy running here and there. Take a few minutes to rest and ground and feel your connection to the Earth. Meaning: Prosperity is blossoming in all areas of your life. You are strong and grounded. Who you are is enough, just as you are. Connect more fully with nature. The Spirit of Earth asks that you tend to your health. Understand how to use your body’s physiology. Pay attention to how your body feels and respond accordingly. Create a home for your soul. Have objects in your home that feel good to you every time you see them. Be present. Cherish the here and now. 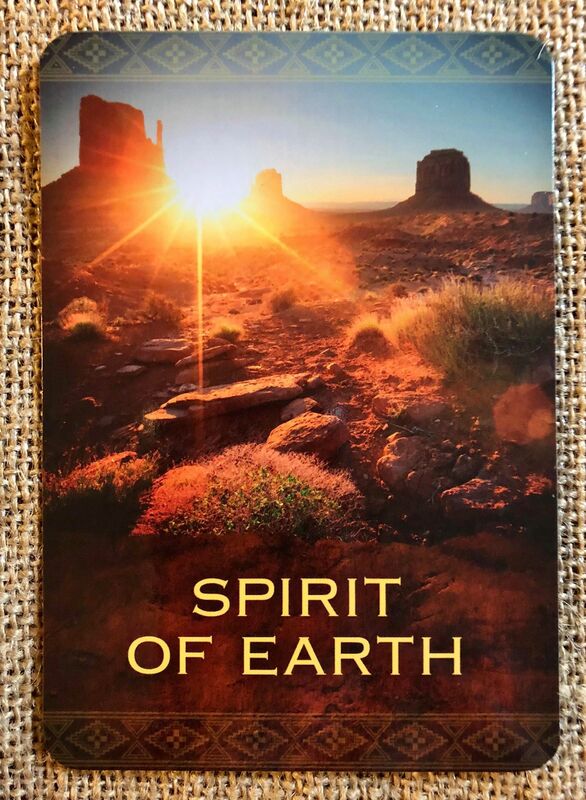 Native Spirit Wisdom: The Spirit of Earth represents your physical self and your physical surroundings. It’s okay to make plans for the future, but make sure the tyou also embrace and appreciate the present. Your’e deeply and profoundly loved and supported at all times, no matter what’s occurring in your life. Trust that all your needs are being met. Take time to create spaces in your home where you feel absolutely at peace, and in doing so, you create a template for peace in all areas of your life. Feel the solidity and power of the earth beneath you; this is in your core. Just as grass pushes up out of moist ground, know that fresh new shoots of growth are similarly taking place within you right now. You are grounded, prosperous, and strong. The Journey: All the solid forms around you, including your body, are a part of they physical realm. Notice how you relate to and identify with the physical universe around you. By doing this you are activating the spirit of earth within you. Let the reality of your relationship with the earth fill your consciousness. Feel it in every pore of your being. Let yourself merge with its energy. Imagine how it would feel feel to be a rolling hill, a great mountain, or a deep canyon. Imagine yourself lying in a meadow of wildflowers high in the mountains. Visualize the roots of the trees extending deep in to the soil, reaching down toward the center of the earth.